The place is very clean and the rooms are simple and elegant. Our villa was beautiful, staff were awesome and location was superb! 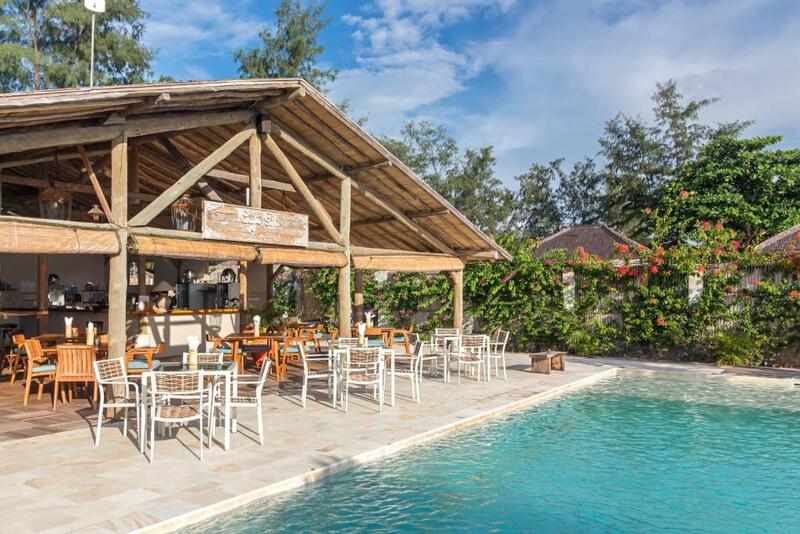 The hotel is Ok, being on the Gili's you cant go wrong. We booked rooms with a private pool in its own self contained area as my wife needed to work, it worked out well and was very relaxing. The complexes pool was small and standard and the beach not quite on the doorstep as the pictures implied (road in between all be it a quiet one). The food at the restaurant was good quality although fish was not fresh and pre-packaged on the barbecue stand. The villa is beautiful. Breakfast spread just okay, nothing much to offer. 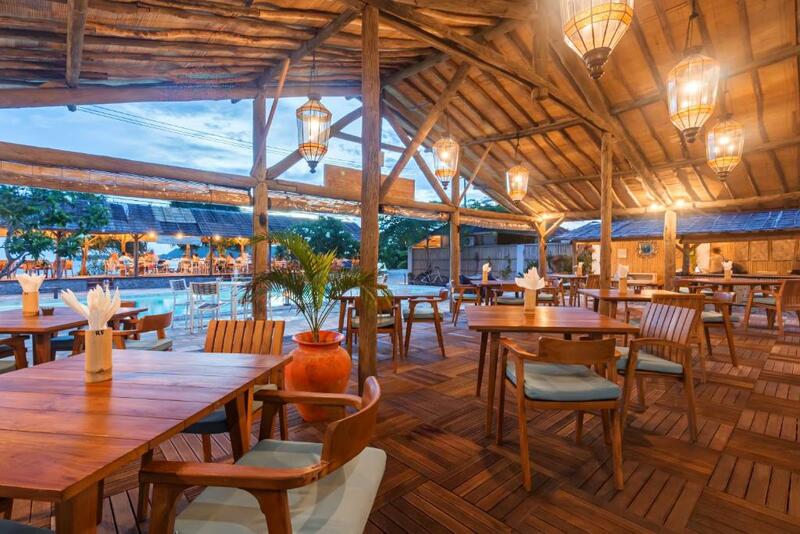 This place is suitable to relax and enjoy the beach unlike Gili Trawangan which is packed with people. The staffs were so kind and always smiley, helpful. Inside the room was comfortable as there is an air conditioner. Close to the beach. Good location. Near the harbor. Swimming with turtles. Absolutely stunning place. Right on beautiful beach where snorkeling can easily be done. Nice breakfast, not too many options though..
Gili Meno is a beautiful island, the water is clean and the blue of the sea is beautiful. People in the island are lovely especially the staff at Avia. They are very kind, helpful and polite. The hotel has a beautiful cafe with a nice swimming pool, they do fish barbecues at night and the beach is just in front of it. Lock in a great price for AVIA Villa Resort – rated 8 by recent guests! 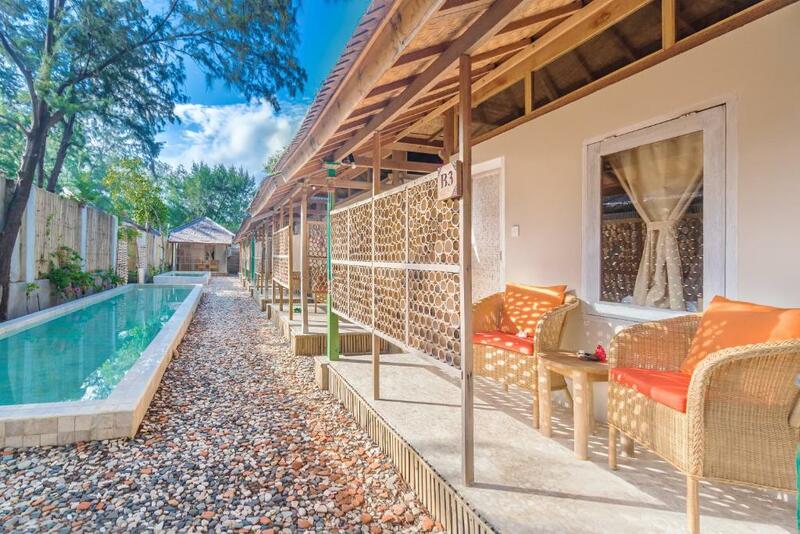 AVIA Villa Resort This rating is a reflection of how the property compares to the industry standard when it comes to price, facilities and services available. It's based on a self-evaluation by the property. Use this rating to help choose your stay! One of our best sellers in Gili Meno! Boasting stylish bungalows on the beach, AVIA Villa Resort is located in Gili Meno, 1.3 mi from Gili Trawangan. 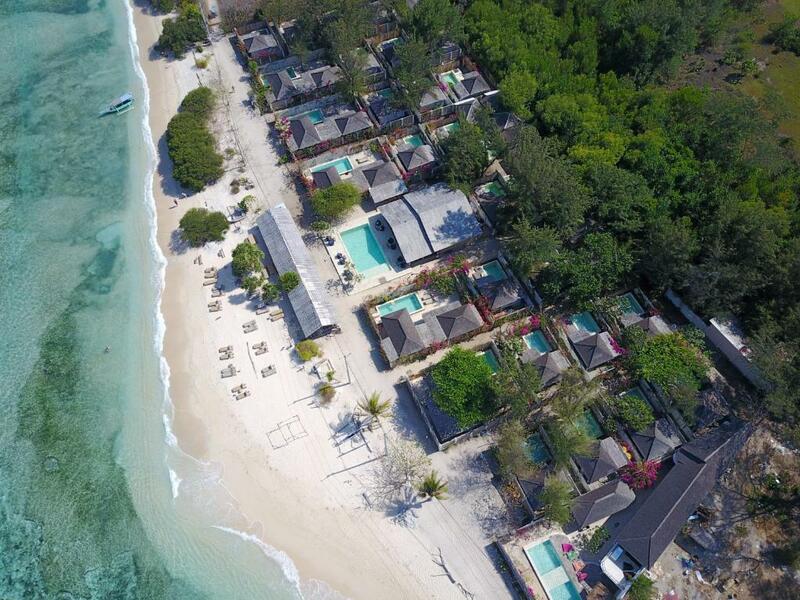 The tranquil resort has a year-round outdoor pool and stunning sea view. There is an on-site restaurant for guests to enjoy a meal. You can find free WiFi in all areas. Designed with a natural style with comfort in mind, every room at this hotel is air-conditioned and features a flat-screen TV. 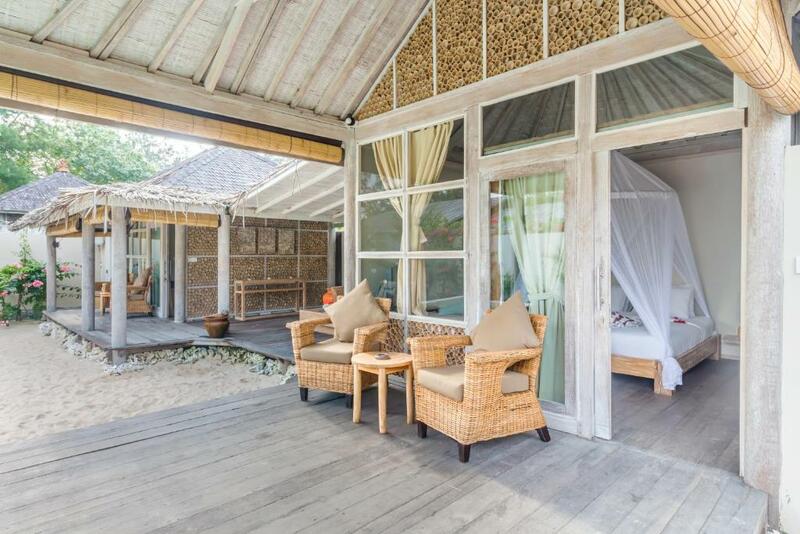 You can spend a relaxing time on the sun loungers by the beach, or in the seating areas of your private bungalow. An electric kettle is provided for guests who wish to enjoy a cup of tea or coffee. Every room is fitted with an open-plan private bathroom. The staff of AVIA Villa Resort will welcome you at the 24-hour front desk. Room service and laundry service are available by request. Tanjung is 7.5 mi from AVIA Villa Resort, while Gili Air is 2 mi from the property. Lombok International Airport is 32 mi away. When would you like to stay at AVIA Villa Resort? Comfortable and spacious for up to 2 people, this 35-sqm bungalow features an air-conditioned bedroom with mosquito nets. There is a flat-screen TV with a DVD player available. An electric kettle and a fridge are provided. Private bathroom is fitted with a walk-in shower and free toiletries. Comfortable and spacious for up to 2 people, this 45-sqm bungalow features an air-conditioned bedroom with mosquito nets. There is a flat-screen TV with a DVD player available. An electric kettle and a fridge are provided. 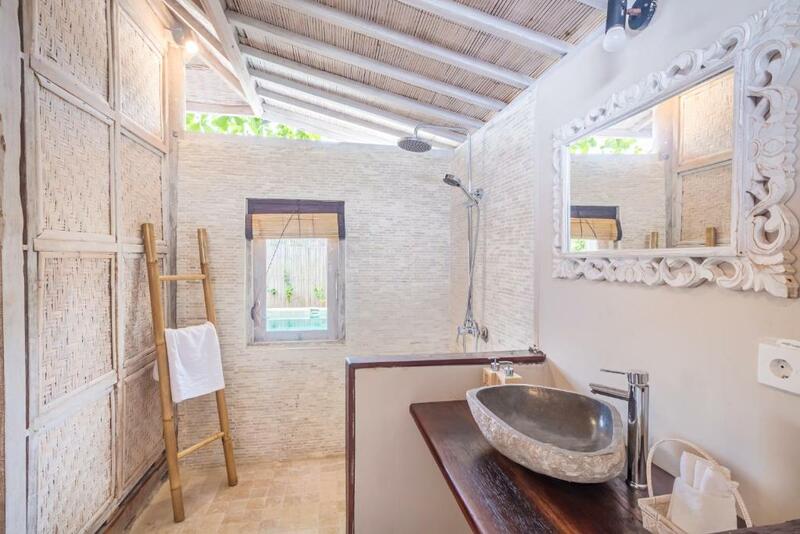 Private bathroom is fitted with a walk-in shower and free toiletries. Guests enjoy a private pool. 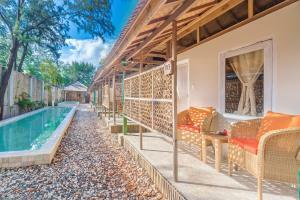 Comfortable and spacious for up to 4 people, this 65-sqm bungalow features an air-conditioned bedroom with mosquito nets. There is a flat-screen TV with a DVD player available. An electric kettle and a fridge are provided. Private bathroom is fitted with a walk-in shower and free toiletries. Guests enjoy a private pool. 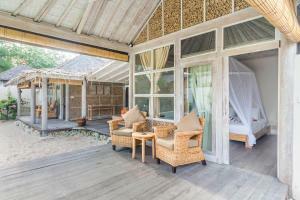 Beautiful tropical villas located in Gili Meno, with the amazing sunset beach. 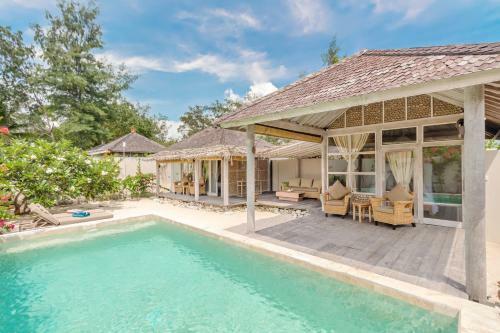 Consist of 39 bungalows and villas with private pool, the property provides 24 hours front desk, wireless internet access, room service, daily maid services, and transport arrangement. House Rules AVIA Villa Resort takes special requests – add in the next step! AVIA Villa Resort accepts these cards and reserves the right to temporarily hold an amount prior to arrival. The hotel is good but too expensive for what you get (compared to other places where we staid in Indonesia) : -the hotel looks nice but it's starting to get old. -the bed winced a lot and we felt the springs. -no drinking water refill avaible (they give us just one small bottle per person per day). -the staff entered our terrace even if the "do not disturbed" sign was on to take care of the swimming pool. -staff was friendly but they where a bit rough and insisting (came very frequently to ask for orders at the hotel beach). Breakfast was good but we expected better (it was the most expensive hotel we had but the most disappointing breakfast). The room was very nice. The pool too and the water was refreshing. (more than the sea) Wifi was good. The hotel beach was nice. Location was good. There were plenty of bugs. Luckily there is a net around the bed. It is quite a far walk from the harbour so don't have much choice when it comes to meal times as we didn't want to walk all the way in the dark. Horse and cart is an option though. A drying rack would have been good! The pool could have been a little cleaner there were lots of leaves in it. The breakfast was poor, not a lot of choice and wasn’t very tasty. Toaster hardly worked. Staff could have been friendlier and more attentive. Loved the location right on the beach and the private pool was great :) they have done very well considering the devastation to other hotels on the island. The mosquitos were everywhere it would have been good to have some mosquito coils provided to use each evening and the staff to put some around the restaurant at night. Walking around the island it was good to see that the beach area in around Villa Avia was well maintained and kept cleaner than some other areas. The rooms were well appointed and well maintained. The staff were very helpful and friendly and nothing was too much trouble. The environment was peaceful and relaxing, just what the family needed for those few days. The rooms were expensive but this seems to be the standard on the Gili's so can't argue. That said there were too many issues with paying for food and Spa, the staff pushed for payments immediately but would then be unwilling to add to the bill when we ordered an extra coffee, for some reason this had to wait and go on a separate bill later. Overall for the price we got a private room but little to set it apart from cheaper options. The breakfast was very poor. The restaurant. The lack of proficiency of the employers. Lots of Mosquito's! Obviously this is not confined to Avia, it is a Meno thing. Avia do well to deal with this with nets and bug spray. Unless you want to take a long walk, your dining options are limited. 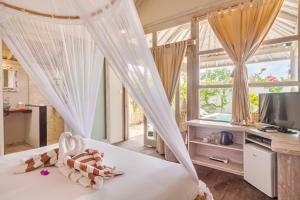 Avia Villa resort is situated on a beautiful white sandy beach with views back towards Gili Trawangan. The resort was well presented with a dining area beside the pool. The room was nice, very comfortable bed with large mosquito net. Salt water private pool was epic! Perfect depth with floating bean bag to relax on. Bungalow is not good. Its a small rooms stanting in a row, with super small open terrace. Bad smelling inside. Not worth its money. Beach - now chanses to swim without coral shoes. Villa is very good. Choose this option if you ok with price. Staff is always ready to help, many thx to them. The menu was very limited and just not great , and overall the food was not good , it just fell short in taste and quality , very few vegetarian /vegan options and what was there was not always available . The pool was not always clean as it should have been . This resort although according to staff was only three years old appeared to be showing signs of wear and neglect ,or just wasn’t constructed well in the first place , a little bit more maintenance and attention to details would make so much difference . It just felt like corners were being cut for profit , for example the soap in the pool bathroom felt like it was watered down or of very poor quality and there was no soap provided for the room bathroom at all . A few umbrellas on the beach for their loungers like other resorts have would be reasonable as the sun is so intense and there is very little shade . The location is great and the hotel really nice, especially the 4 person villas directly at the beach. The food is good but breakfast could be a bit better. I would recommend to try some restaurants around as well. Markus was really nice helping us to arrange some tours. From all the hotels on the island we would always book this one again, we really enjoyed it. The only complaint we have is the bathroom is situated with a "half roof" which allowed a lot of mosquitoes and bugs into our room. There is a wooden door that can be shut to avoid this but the bugs still made it in. Good job it has a net curtain around the bed. We only stayed here for one night and the resort was what we wanted for this night. The room was clean and staff friendly. The food in the restaurant was very nice and the area situated on the beach was lovely.